As a fan of bicycles, you’d have to be completely oblivious to not know that there’s a renaissance of sorts for steel bicycles, particularly at the low volume, artisan end of the market. Many individuals are leaping into the trade with wonderfully ornate bicycles, but sometimes I wonder about the design choices they make. People want to believe that they have an instinctive feel for what is sound design, the assertion that if it “looks right, it is right”. 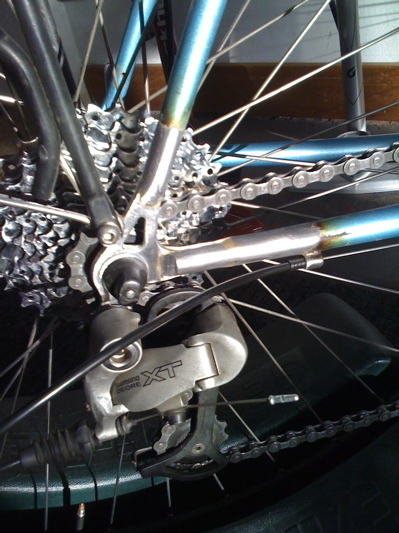 The basic skills of framebuilding do not differ that much from other trades such as jewelry making or other more mundane fabrication employment, but a bicycle is a lot more complex structure than a broach or a welded iron bed frame. Not a whole lot of engineering goes into traditional steel framebuilding, so experience building and repairing steel becomes the guiding hand in design. Take for instance the right rear dropout. It is one of the most highly stressed areas of the frame. It may not be the best place to get really fancy with one’s file. And even when you might think that a design may be quite conservative, you still have to worry about the metallurgy of the dropout itself. Is it forged or cast, how consistent is the product supplied by the manufacturer? 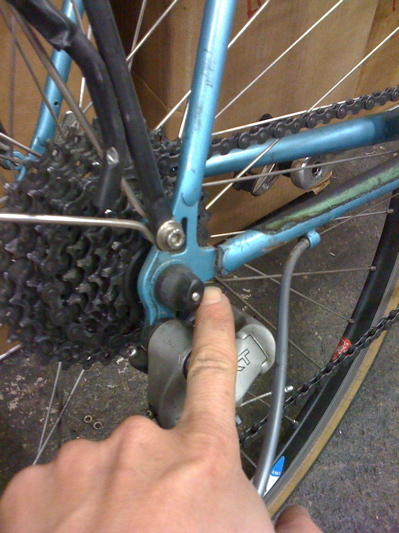 In the photo above is a broken dropout from a company supposedly run by elves (who happen to be enamored of the French). I’ve seen at least 7 or more of these bikes come into Davidson Cycles for the same repair; we’re almost like an official repair contractor for the other bike company. Yes, it’s steel and can be repaired, but it isn’t cheap or convenient. Part of the problem for the repair is having a right dropout that is a geometric match for the left. This repair looks like we had an oem dropout available, but if the angle between the stays were different, maybe we would have had to modify a Ritchey dropout. 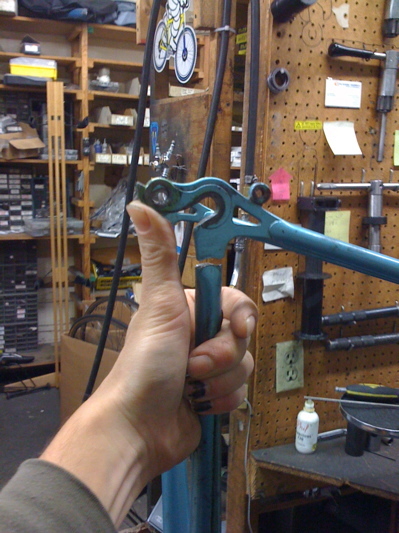 Speaking of which, Bill Davidson has said that he’s never seen the flat-style Ritchey dropouts fail. The customer opted not to pay for a repaint, so after I got the bike back from the frame shop I just assembled it as is. You can plainly see the new brass and where the paint was blasted off from the work area. Bill Davidson started out repairing bikes before building frames under his own name. It helps that his father had a fabrication company, but Bill has often told me that repairing frames is more difficult than building from scratch.